These are the various Christmas panels I’ve used as “gifts” to visitors on the original club site. They would replace the home page from December to January. Our 2008 panel is actually a scan of a gift bag I found at Dollar Tree. It’s what inspired me to do Christmas panels in the first place. Technical point: Unlike today’s modern gift bags, which have an adhesive-backed plastic tab for hanging on display pegs, this one had a machine-punched hole right in the bag — right in that radiator grill, in fact. (And we all know how bad it is to have a hole in your radiator!) So, after scanning I zoomed in on the hole, copied a small section from elsewhere on the radiator, dropped it in place … BOOM! Fixed! Then I charged myself $400.00 for parts and labor. For the 2009 panel, I wanted to showcase all the “Christmas-themed” vehicles I owned at the time. I wanted (needed) something other than a plain desk or table, so I used a Christmas placemat. Certainly you recognize most of these vehicles from the various Target, Wal-mart or Toys ‘R’ us special sets … but you might be wondering about li’l Sooo Fast on the left there. It’s from a Hallmark ornament set. But, I hear you thinking, it’s clearly an actual Hot Wheels model! Yes, it is. It’s both. It’s a floor wax, and a dessert topping. 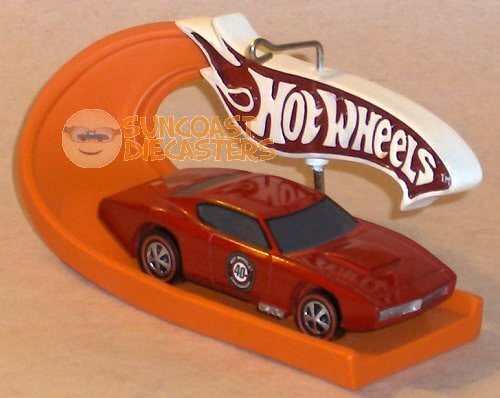 Nowadays, Hot Wheels-themed ornaments from Hallmark are either off-size replicas (such as Roger Dodger), or static displays (such as Custom Otto). 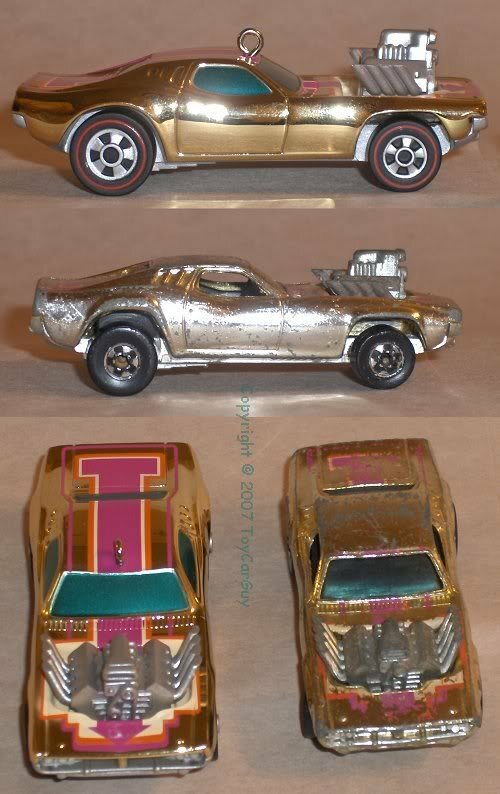 this one, however, is an actual, rolling, track-worthy Mattel creation, which was paired with a smaller version of itself jumping through a ring of flame, because that’s so holiday! Inspired by 2010 (the movie), plus the fact that I had the “computer” font on my computer at the time (of course I had the “computer” font on my computer! ), I replaced the December 2009 panel with this one in January of 2010, just to be silly. For our 2010 Christmas panel I was attempting for the first time to create a nighttime scene. But no matter my changes in lighting or camera settings, I couldn’t get a satisfactory result. So, I cheated by simply applying a blue tint over the best photo I had at the time. Not really satisfactory, but it got the job done. Our 2011 panel, my first attempt at creating a complex, lit scene. The snow (a tree skirt), trees and LED lights are from Dollar Tree. You of course recognize the ’96 Christmas-edition Nomad. The service station is actually a Hallmark ornament. I don’t know if it was designed to be at a particular scale, but it sure fits the Nomad nicely. And what must be the teensiest manger display ever was found at a church rummage sale. In 2012 I uploaded our club’s first-ever video. It was in *.wmv format, and took a while to load into a visitor’s browser. In 2015, I found, thank God (literally), a copy of the original video file on an external back-up hard drive, and uploaded it to our Vimeo account. It’s compressed, and loads much more quickly. Enjoy! Christmas 2012 from Suncoast Diecasters on Vimeo. By the good grace of the Lord, the Snoopy car became available. As I already had the Red Baron, the panel idea for Christmas 2014 sort of built itself. The only issue was the background. As you’ve seen, I’d used the “star-filled night sky” cardboard backer several times by then. However, I wanted a daytime scene this time. Again by the good grace of the Lord, I found a free stock photo site which had an image which worked perfectly. In 2016, I created a screensaver to celebrate Suncoast Diecasters‘ tenth anniversary. Each club member received a copy on CD at our December ’16 meeting. I also uploaded it to a file-sharing service and provided a link for the download in our December ’16 update; it was available through January 2017. The ‘saver features a combination of Christmas panel images and photos of various in-meeting Christmas displays. It has a wide variety of customizable image transitions. It includes a playlist of several Christmas songs, and the playlist is customizable with one’s own music files. I have a variety of holiday-themed cars. But for 2017, I focused on specifically Santa-themed cars (plus one reindeer). Thus the idea for The Li’l Saint Nicks was born. I had originally wanted to do it as a video, but extra holiday hours at work put a time crunch on me. The slideshow format was quicker to put together, and still very satisfying.